In this May 9, 2016 file photo, Sen. Pat Toomey, R-Pa., speaks during a news conference in Philadelphia. Former Democratic congresswoman Gabby Giffords is endorsing the re-election bids of Republicans U.S. Sen. Pat Toomey of Pennsylvania and U.S. Sen. Mark Kirk of Illinois, citing their votes on gun control. Giffords and her husband, Mark Kelly, made the endorsements in a Monday editorial on behalf of their organization, Americans for Responsible Solutions. Giffords was gravely wounded in a 2011 mass shooting in Arizona. They cite votes by Toomey and Kirk in 2013 to expand background checks on sales at gun shows and online after the shooting rampage in Newtown, Connecticut. They say Kirk and Toomey "broke from the gun lobby." Toomey's opponent, Democrat Katie McGinty, says Toomey has hardly strayed from the National Rifle Association's positions. The battle for Kirk's and Toomey's seats could tip control of the Senate. In a fight for his political life, Pennsylvania's U.S. Sen. Pat Toomey is abandoning a major international trade deal that has emerged as a divisive campaign issue. 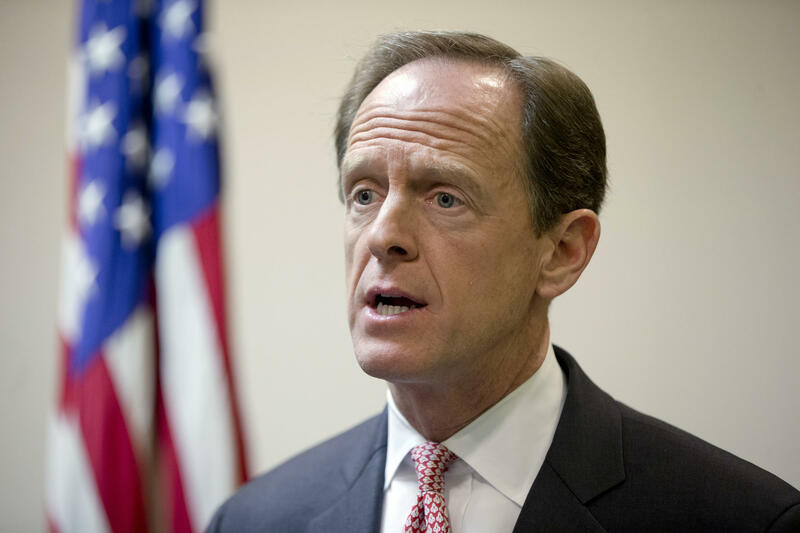 Toomey, a Republican, wrote in an editorial published Wednesday that he's brought problems with the Trans-Pacific Partnership trade agreement to the attention of the Obama administration, but they remain unfixed. He said the agreement, as it stands now, isn't a good deal for Pennsylvania and he can't support it. The Republican National Convention wraps up in Cleveland tonight with speeches from prominent republicans, religious leaders, business moguls and presumptive nominee Donald Trump. Pennsylvania Democratic U.S. Senate Candidate Katie McGinty said she has been struck by the negative tone of the gathering. As sexual assaults in the military increase, supporters of a bill aiming to protect victims are working to drum up support. Between 2014 and 2013, the number of reported sexual assault cases in the military jumped 11 percent, and 2013 numbers were 53 percent higher than in 2012, according to the latest numbers from the Department of Defense. Pennsylvania has a long history as an important swing state in presidential elections. But over the last decade, approximately, political shifts have kept the state swinging left again and again—Republicans haven’t won Pennsylvania since 1988. Nevertheless, both Donald Trump and Hillary Clinton are fighting hard for Keystone State votes this year.